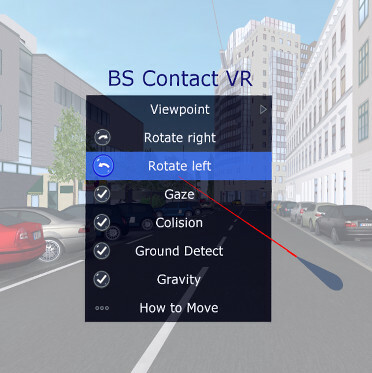 If a VR application does not override it, BS Contact Stereo displays its own menu when the user presses the menu button on the Oculus Touch or Oculus Remote controllers. The menu can be controlled via the Oculus Remote controllers in form of laser pointers, with the thumb stick, with the Oculus Remote, or even with the keyboard. It contains entries for selecting the viewpoints, rotating the view and turning on/of flags like collision detection and gravity. It also alows to display a diagram that explains how to navigate if navigation is enabled.